The number of women diagnosed with breast cancer is large and it is increasing day by day. One in eight women has a chance of breast cancer diagnosis in her lifetime. This is a dangerous disease and there are many risk factors. 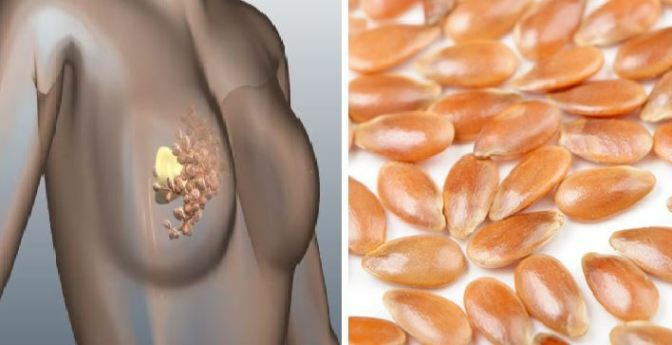 There are loads of researches about reducing the risk of this terrible disease and a research has shown that flaxseeds are a potential cure for breast cancer. It has been shown that one ingredient in the flaxseeds called lignin is what works against breast cancer. It has a weak estrogenic effect on the body and it is classified as phytoestrogen and it reduces the amount of natural estrogen which affects the cells. Beside lignin, flaxseeds contain fiber and omega 3 fatty acids. All these can be a great prevention against breast cancer. How do flaxseeds prevent breast cancer? 80% of the breast cancers are estrogen – receptor positive. Lignin can help in reducing the risk of developing breast cancer because they interfere with the natural estrogen processes in the body. A great number of researches, studies and trials have been conducted and it has been found that flaxseeds definitely are a great prevention against breast cancer. Beside prevention, they can serve as a treatment for patients who are already diagnosed. A clinical experiment has been performed on patients with breast cancer. They have been given a muffin with flaxseeds and a muffin without flaxseeds. Those patients who consumed flaxseeds had increased apoptosis and decreased cell proliferation in the breast cancer. Normally, cancer cells live longer than the other cells and apoptosis is the process which describes the death rate of the cancer cells. Proliferation on the other hand, is used to describe the tumor growth. Cancer tumors grow very fast and that is because of the fact that cancer cells proliferate quickly. 2.5 tablespoons of flaxseeds increases the cancer cells death rate. Another study showed that women with breast cancer who consumed flaxseeds while fighting the disease, lived longer compared to the women who didn’t consume flaxseeds. All in all, flaxseeds are natural prevention against breast cancer and they can fight the already existing cancer cells. A person with breast cancer should consult their doctor in order to make a nutrition plan with increased amount of flaxseeds in the diet. How do you take the flaxseeds? The most important rule of flaxseeds is that they have to be grinded in order to be fully digested. If they are whole, they might only pass through the intestines without being digested. You can grind them in a coffee or spice grinder.